QUEBEC CITY, Quebec — I’m not going to lie. 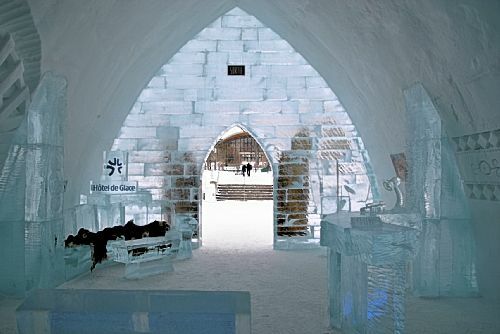 My husband thought I was nuts when I suggested spending my January birthday at Hotel de Glace here in Canada. Our winter getaways typically are spent someplace warm, preferably with a sandy beach, always with a pool or waterfront bar that serves fruity cocktails garnished with colorful paper umbrellas. Yet ever since watching a documentary a few years ago on how the igloo-like structure springs to life from December to March, I’ve been fascinated by the idea of making like an Eskimo (or Inuit, since this is Canada) and staying there. I’m not the only one: Hotel de Glace — the only hotel in North America made entirely from snow and ice — has welcomed more than 700,000 visitors since it opened in 2001. About 30,000 adventurous souls have actually checked in, one third of them families. Make that 30,002, thanks to a whole lot of sweet talking. Here’s what I can tell you about it: It’s breathtakingly beautiful. Exotic and unique. Worthy of any adventure-seeking traveler’s bucket list. And here’s what it most definitely is not: Action-packed. Comfortable. Cozy, save for the time spent sitting in the hotel’s sauna or soaking in one of three spas set up under the stars. It’s also far from a bargain. Expect to pay $30 for the 10-minute cab ride from downtown, and $9 for those yummy (but tiny) vodka cocktails in the Ice Bar. As for the cool, but surprisingly spartan rooms, they start at about $440 a night for two, even when purchased with a Groupon. But oh, what a once-in-a-lifetime experience. 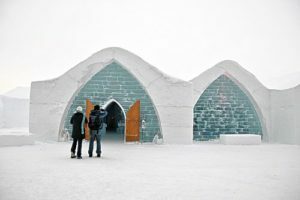 It takes six weeks, 50 people and about $3 million to build the 30,000-square-foot Hotel de Glace (pronounced oh-tel de glass). Work begins sometime around Thanksgiving, when the temperature falls to a constant 23 degrees. Snow from the sky is too dry and airy to be used as a building block, so giant snow blowers are brought on site to create the 15,000 tons of dense man-made snow needed for the structure; it’s blown onto metal molds shaped into arches and domes retained by wooden walls. After the molds are removed three days later, ice blocks weighing 500 tons arrive and a team of 15 sculptors carve columns, furniture and exquisite ice sculptures that will be lit with colored lights. The result is nothing short of spectacular. Graced with intricate wall etchings, 18-foot ceilings, a super-slick ice slide and a majestic ice chandelier, the Grand Hall is as fabulous as its name suggests. But the Ice Bar is pretty cool, too. Large enough for 400 partyers, it’s the hub of the operation, pulsating with loud disco music and flashing a wild kaleidoscope of colors all night long. You can get a beer, but most fill the 75,000 ice glasses the bar uses throughout the season with drinks made with Pinnacle vodka or Quebec cider. 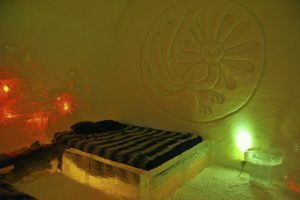 As with Sweden’s ICEHOTEL, the Hotel de Glace is built around a theme; 2012 celebrates the First Nations of Northern Quebec. Each of the 36 rooms and suites is a little different, with the fanciest ones featuring elaborate designs carved into their thick snow walls. (Ours featured murals of trees and an Inuit canoeing and a life-sized ice Inuit in the corner.) A handful are equipped with fireplaces, but as our guide Sophie Vaillancourt pointed out, they’re there to warm the “heart and soul” instead of the body. The air inside the hotel hovers in the 20s but feels more like 8 or 9 degrees, so guests typically gather in the bar or the heated Celsius Pavilion next door. That’s where overnighters leave personal effects in lockers, take showers, check email or the Internet, or relax on leather couches with an endless supply of free hot chocolate and coffee. The hotel offers specially designed “romance packages” — a notion we found kind of ironic, because the last thing on your mind when you can see your breath in your bedroom is, well, you know. It’s tough to feel amorous when you’re afraid your nose just might freeze off your face. That said, at least two dozen couples will get married or renew their vows this year in Hotel de Glace’s fairy-tale chapel (Quebec designer Corine Markey’s Marie-Ange collection of wedding dresses and coats keep a bride warm up to minus 22 degrees) and then spend the night in the deluxe honeymoon suite, which includes a private spa and sauna. People also celebrate birthdays here, shoot ads, host happy hours and dance parties in the Ice Bar and use the hotel’s facilities for business meetings and corporate retreats (what better way to team build than with an ice sculpting workshop?). Hotel de Glace is at the doorstep of historic Old Quebec, making it convenient for travelers who are just as eager to explore the walled city’s cobbled streets and stuff themselves silly with French food as spend the night on ice in a sleeping bag. That’s right: You zip yourself into an Arctic-rated mummy bag after wiggling, just so, into a cocoon-like fleece liner. We were also advised to sleep on our backs (it’s difficult to make a mummy bag turn with you when you roll from side to side) and go to the toilet before turning out the lights. If you have to get up in the middle of the night to go, it’s a chilly five-minute walk to the bathroom. Staff assured us only 1 percent of guests don’t make it through the night, and to be sure, only one person was sleeping on a couch in the pavilion when I got up at 4 a.m. to use the bathroom. But despite the hotel’s thick soundproof walls and candle-lit ambience, I’ll bet many guests don’t sleep like babies. Many of the people we talked to the next morning, my husband included, claimed they were perfectly toasty. Not me. Save for warm hands and toes, I was acutely aware most of the night that the mattress was boxed in by ice. I wasn’t cold per se, but I also wasn’t what you would call warm. And my husband, who sleeps with his mouth open (I know, yuck) swore he woke up in the middle of the night with a frozen tongue. You have to be out of the room by 8 a.m. so they can be cleaned before public tours begin at 10 a.m. The main memory I took away was the sense of being cold — at the Ice Bar, where I had to keep moving while sipping my frozen cocktail; in the spa, where my hair turned into icicles and my towel froze to the hook; and in the room itself, where the chill seeped in through multiple layers of high-tech materials and got into my bones. After the Ice Hotel closes on March 25, owners let it melt for a few weeks, then they bring in bulldozers to clear the area. Then next Thanksgiving, it rises again. Getting there:Unfortunately, there are no direct flights between Pittsburgh and Quebec City. (Our early-morning flight connected through Philadelphia.) Depending on what day you travel, a round-trip ticket on Air Canada, US Airways or United starts at about $650. You’ll need a passport to enter Canada. The exchange rate for the Canadian against the U.S. dollar is almost even, so we didn’t worry about changing money, especially since most merchants accept American currency. Prices listed below are in Canadian dollars. Checking in: Hotel de Glace is about 7 miles north of the city on the site of the former Quebec Zoo, in the suburb of Charlesbourg. This year the hotel is open through March 25. Rates start at $219 per person or $475 for a family with three children age 12 or under. It includes a welcome drink in the Ice Bar and breakfast — toast and jelly, sausage, scrambled eggs, fried potatoes and cereals. And coffee. Everyone needed coffee.Guided tours cost $17.50 for adults. $15.50 for students/seniors, $8.75 for children or $43.75 for families. Nighty night: Rooms don’t open to guests until 9 p.m., and the lounge area in the heated Celsius Pavilion is quite small, so don’t arrive too early. Also, be sure to eat dinner beforehand or bring snacks, as the only food option is a small cafe serving forgettable soups and paninis until 8 p.m. (I’ve eaten better in a middle school cafeteria.) The hotel also can order in food. To avoid any surprises or discomfort after crawling into your Arctic sleeping bag (rated to minus 22 degrees), all guests must take a mandatory “training session” before retiring. You’ll also get a preparation guide to help you with packing when you make your reservation. Essential accessories include warm boots, a hat that covers your ears, mittens and an extra pair of socks. Cool activities: New this season is a 40-foot outdoor skating rink (skate rental is $7) and a 64-foot-long outdoor slide made of ice and snow. Hotel attractions include the Ice Bar and disco, which stays open until midnight, and access to the Nordic area’s outdoor spas and sauna from 8 p.m. to 8 a.m. Activities nearby include cross-country skiing, dogsledding, snowmobiling and massage and beauty treatments at the nearby Four Points by Sheraton Quebec. 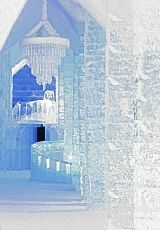 More info: www.hoteldeglace-canada.com or 1-877-505-0423.